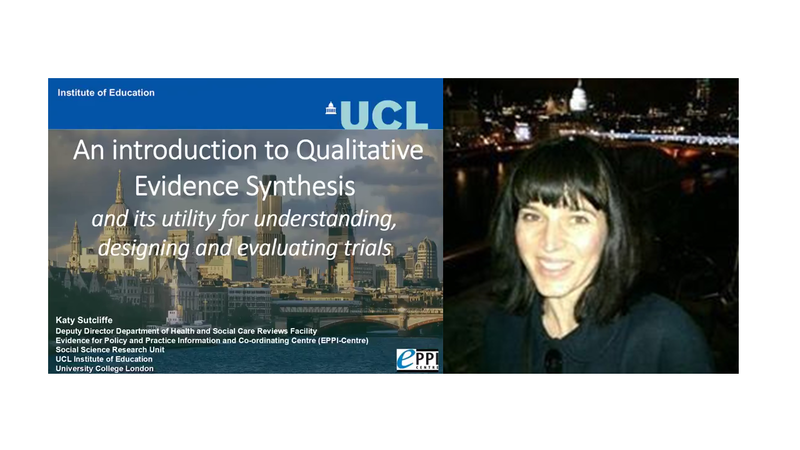 QUESTS collaborator Dr Katy Sutcliffe delivered a webinar, titled “An introduction to Qualitative Evidence Synthesis and its utility for understanding, designing and evaluating trials”, on 25 May 2018. Including diverse types of evidence in systematic reviews can increase their relevance for decision makers. Qualitative Evidence Syntheses (QES) bring together research that reports people’s views and experiences of, for example, a particular illness or healthcare approach. As well as being of value in themselves, QES can assist policy makers with interpretation and implementation of the findings of systematic reviews that evaluate intervention effectiveness. Katy began the session with an overview of the underlying logic and methods of QES. She then described some examples of QES to exemplify how they can assist policy development. Finally, Katy, and QUESTS Co-Chair Dr Catherine Houghton, described a current QES being undertaken at NUI Galway on the factors that impact on recruitment to trials in healthcare. Dr Katy Sutcliffe is based at the Evidence for Policy and Practice Information and Coordination Centre (EPPI-Centre), Institute of Education, University College London. She is the Deputy Director of the Department of Health Policy Reviews Facility which produces research syntheses to address Department of Health policy needs and is a collaboration with the University of York and the London School of Hygiene and Tropical Medicine. Katy specialises in developing systematic review methods for producing policy-relevant evidence, in particular qualitative and mixed-methods evidence syntheses and approaches for identifying the key ingredients and underlying mechanisms of interventions. This webinar resulted from a knowledge exchange programme funded by the Irish Research Council’s New Foundation Scheme, awarded to Dr Catherine Houghton to develop a clearly articulated pathway between QES and trial methodology, and further develop QES expertise in Ireland.